The quiet, deliberate piano notes drifting eerily. The desert colorful under the setting sun, with a crescent moon on the rise. The walk to a home in ruins. A girl’s intent gaze at her bloodied reflection in a mirror, and the nightmare that follows. All within the first few minutes. Damn. Nicely done, Severed. In Drinkbox Studio’s latest, which was recently released digitally on the PlayStation Vita, the harsh setting and stylish form never lets up. There’s little explanation of the situation at hand in this Action RPG dungeon crawler after the opening scene, save a few cryptic remarks about what’s actually real. Sasha, the game’s protagonist, is told to go search for her family, soon after realizing she’s lost an arm. From there, she sets off destroying demons and cutting off their limbs for use in enhancing her fighting abilities. She’s able gain use of some of their innate abilities too. Severed predominantly makes use of its visuals and gameplay to describe how desperate and brutal a world it is. It’s beautiful, and so very depressing. In my time with the game thus far, what I really like about Severed is its use of color and that stunning Mexican Muralism art style. Everything is in ruins, and even with its colorful, distinct visuals; the game still manages to highlight its hopelessness. There’s something to be said when turning towards a brightly lit path gives you the same dread as the path drenched in an unsettling red. There are some areas that utilize night-time scenes and rain, or darker tones to show the world’s bleakness too. But unraveling Sasha’s story makes me truly understand just how desolate, and formidable a world it truly is. It’s a home to demons who are just as beautifully creative, even if they’re grotesque and frightening things with big teeth, multiple limbs and sharp claws. Severed makes it clear early on that there’s little hope to cling to. There’s so much ambiguity as to what’s really going on, but it still manages to make everything Sasha experiences so desperate. Sasha’s audible reactions are the things that destroy me—it’s in her shocked gasps. The game’s first person perspective works so well here for so many scenes as they highlight her slow-paced movements and her silences when confronting various situations. It’s cruel and unforgiving—and the same can be said of Severed’s gameplay. I can’t stress this enough: it is a challenging game. It’s not unfair but it requires absolute focus and strategy. Smart choices and quickness are imperative for success—something I learned first hand being stuck in a cavern with status buffed monsters and environmental effects. I had to rethink what I was doing, and eventually made it through. Since then, I’ve had more instances like this. Multiple monsters can attack in any given battle, each taking on new ways to increase the difficulty as Sasha gets more abilities of her own. It’s handled well and combat feels fluid as it’s fantastically suited to the PlayStation Vita’s touchscreen capabilities. It make sense. Severed wouldn’t present such a strange, difficult reality for Sasha to experience and explore, just to make things easy when facing all those dangers. 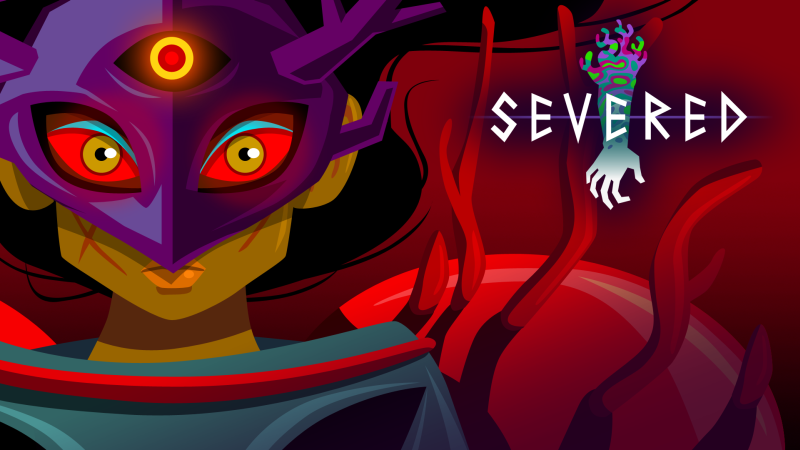 Severed is disturbing for how normal everything feels once when you’re tossed into its world. Cutting off limbs. Wearing body parts. Nothing is explicitly questioned by Sasha but that’s the best part about it. Severed doesn’t need Sasha to tell her story through grand vocal gestures to point out the obvious—the beautiful visuals, the art style, the devilishly difficult gameplay and the grim world do all that. And it’ll have players questioning everything right from start, thanks to its fantastic opening scene.